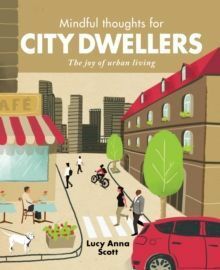 "This engaging book helps town-bound readers discover the joys of urban living." - DAILY MAIL "A quirky guide to the greener side of the capital, offers stories and advice on how to find nature and comradeship in the sometimes-isolating and always hectic metropolis." - Elle Decoration "Lucy Anna Scott advocates getting out to the nearest available natural feature of the city." - BALANCE "Lucy Anna Scott outlines simple ways to find moments of calm in our often chaotic urban lives." - Square Mile "Have this gem of a book by your bedside for quietening your thoughts and be that better person who takes life at a more considered pace." - Little Bird: An Insider's Guide to London We've come to believe that living in a city is the very opposite of living a mindful life. But this couldn't be further from the truth. Enriching, inventive, ever-evolving, and social, cities are rich with ingredients for sparkling spiritual health. In this beautifully illustrated little book, Mindful Thoughts for City Dwellers leads the reader on a joyful journey through the city. From noticing urban nature to embracing noise as sound, author Lucy Anna Scott shows us how to find a home for the head, and the heart, in the metropolis-humanity's greatest invention.